After the implementation of the General food law in the EU a modification of many German regulations became necessary. The German legislation differs from the legislations of other European countries because of the federal system. To a bigger part the execution of EU or national regulations is incumbent upon the federal states. Germany consists of 16 federal states and as a result it could have 16 different interpretations of one EU regulation. This situation could be really difficult for small and medium sized enterprises, because of different conditions of competition. The following figure 1 gives an overview of German regulations. The Schweinehaltungshygiene-Verordnung manages a veterinary support of the pig producer and of finishing farms. This obligate veterinarian support has the objective to improve the health status as well as to inspect the pigs clinically, especially on signals of epidemics. Besides the veterinary farm checks cleaning and disinfection, internal self-checks as well as demands for reproduction are included in the Schweinehaltungshygiene-Verordnung. See the detailed regulation. The hygienic conditions for all animal transfers and the clear identification of animals are regulated in the Viehverkehrsverordnung. Every pig farmer has to report the receipt of pigs within seven days to the national database HIT (German livestock information system). See the detailed Tierische Lebensmittel. A precondition for the attendance to the QS-system is the salmonella monitoring of hogs. Since March 2007 this salmonella monitoring also became obligatory by law through the introduction of the Schweine-Salmonellen-Verordnung. All finishing farms with a herd size more than 100 (more than 250 hogs per year) have to detect their salmonella status within one year for the first time in March 2008. An amount of the demanded samples per farm results from the number of slaughtered pigs. Table 1 shows the official sampling scheme. All samples are sent to the animal health service to be analysed. Farmers have to collect their results, to calculate the percentage of the positive salmonella samples in average of the past twelve months and to save them for at least three years. On basis of these average values they quarterly have to detect and document the salmonella antibody status of their livestock according to table 2. If the farmers participate in the QS system these calculations are done by the QS coordinator and the results are saved in the official QS database. Farms, which are classified in the third category, are obligated to inform the public veterinary agency in written form. In cooperation with the farms veterinarian they have to identify the salmonella entries and implement activities for the reduction of the salmonella prevalence. The Tierseuchengesetz rules the proceeding and the responsibilities within the scope of research on animal epidemics as well as the regulations about the intra-community animal transport. Additionally, it deals with the import, export, the obligation to disclose and inform as well as the monitoring executed by veterinarians. This order influences the whole production chain. However, the focus lies on primary production. In recent years German pork production has become more focused on quality, which is assured by the private quality system QS. This system was first implemented across all stages of production as a consequence of the BSE crisis and other crises in the food sector in 2001. Comparatively high pork production costs and competition with the national quality systems of other EU member states supported the development of this national quality standard. In 2006 about 90% of the pigs in Germany were slaughtered under the QS system, and that percentage continues to grow. The abbreviation QS stands for quality and assurance. The main objectives of this national quality management scheme are inter-enterprise quality assurance, transparency of the production processes in the entire production chain as well as strengthening of consumer trust in food. A series of QS compendiums exist for the different production stages of the pork chain: feed monitoring, animal production, salmonella monitoring, slaughtering and deboning and processing. A three-stage control system monitors participants’ compliance with the QS requirements. Each participating enterprise has to document all of its activities as part of the self-control system. At regular intervals, neutral certification agencies check their compliance with the QS criteria. In a third step, the certification agencies themselves are controlled. The quality management is defined by a common quality policy. End products, predominantly fresh meat and to some extent also processed meat products, are marketed via the meat brand program. The controlled pork chain, from breeding to consumer, is part of the marketing concept of this program. All procedures during and along the pork production are contractually and transparently arranged and belong to the common quality strategy of the pork chain. 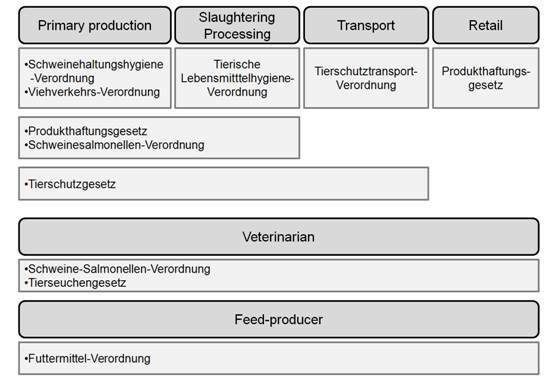 Table 1 shows that this partially integrated system with an own meat brand program is based on the German QS standard (Quality and Safety). All stakeholders of the chain are certificated. The intersectoral IFS standard exists in the abattoir with affiliated processing of the cooperative. Due to the strict requirements of the meat brand program, veterinarians are part of the integrated veterinary support system via general agreements (framework agreements). The official controls along the chain correspond to legal requirements. Following table 1 exemplarily shows the use of quality management tools.